The Solution below shows the G# natural minor key signature on the treble clef and bass clef. This step shows the G# natural minor scale key signature on the treble clef and bass clef. The G-sharp minor scale has 5 sharps. This minor scale key is on the Circle of 5ths - G# minor on circle of 5ths, which means that it is a commonly used minor scale key. 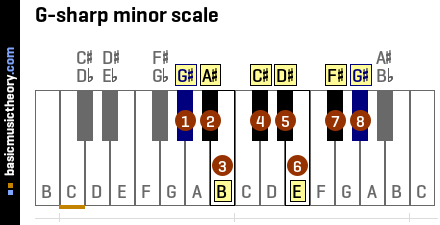 This scale sounds the same as the Ab natural minor scale, which is also a commonly used scale. The same notes are played in the same order in each scale - they sound identical. Only the names of the individual notes are different. The G# natural minor scale has 5 sharps. To understand why the G-sharp minor scale has 5 sharps, have a look at the G# natural minor scale page, which shows how to identify the note positions and names for this scale.